Change in the Arctic region is accelerating. It is unfolding rapidly and in many ways, so that one can expect dramatic impacts on the region’s peoples and ecosystems. Climate change is a major concern, while other environmental changes are also occurring along with rapid economic development and social transformation. While changes may sometimes be gradual, the interactions among different driving forces may combine to have large impacts on Arctic peoples and economies, and on global ecosystem services. Such large shifts can be difficult to predict. They may also be irreversible. Understanding potential thresholds and society’s capacity to adapt and transform is crucial for preparing effectively for an uncertain future. What is the Arctic Resilience Assessment (ARA)? Identify the potential for shocks and large shifts in ecosystems services that affect human well-being in the Arctic. Analyse how different drivers of change interact in ways that influence the ability of ecosystems and human populations to withstand shocks, adapt or transform. Evaluate strategies for governments and communities to adapt. 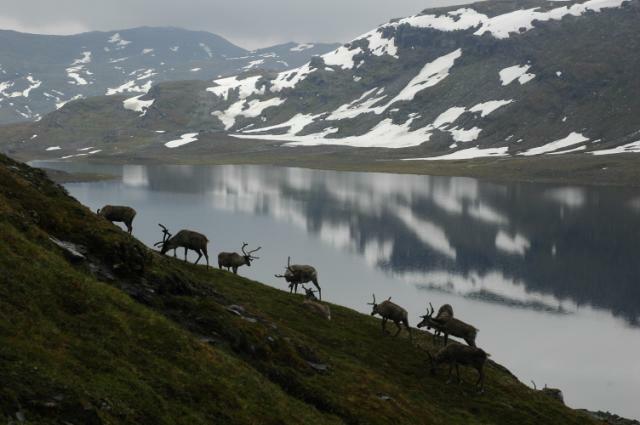 Integrated analysis synthesises expert knowledge about thresholds and feedbacks in Arctic social-ecological systems that can affect ecosystem services. It will also focus on how thresholds and other changes can affect the capacity for adaptation and transformation, including analysis of how policy decisions can help strengthen or risk eroding these capacities. Capacity-building activities aim to ensure that resilience assessments can be used as a tool for dealing with rapid change after the project is finalised. This includes developing a course on Arctic resilience in cooperation with University of the Arctic. Following initial scoping activities, the Arctic Resilience Assessment was accepted as an Arctic Council Project in November 2011. Sweden made the ARA a priority for its chairmanship of the Arctic Council (2011-2013). In October 2014, the U.S. joined Sweden to co-chair the ARA, making strong engagement for resilience an important part of its own Arctic Council Chairmanship (2015-2017). The project, which runs from 2012 to 2017, is led by the Stockholm Environment Institute and the Stockholm Resilience Centre. It builds on collaboration with other Arctic countries and indigenous peoples in the region, as well as Arctic scientific organizations. Collaborating partners include University of the Arctic; International Arctic Science Committee; International Study of Arctic Change; International Arctic Social Science Association; European Environment Agency; WWF Global Arctic Programme. Following initial scoping activities, the Arctic Resilience Assessment was accepted as an Arctic Council Project in November 2011, initially under the name "Arctic Resilience Report"
The ARR Interim report, published in May 2013, demonstrated how a resilience approach can contribute to assessing linked social and ecological changes across scales, identifying risks for “tipping points” and strengthening capacity to respond. It also showed that options for responding to change may be compromised by past decisions and interventions, especially those that have eroded traditional safeguards of resilience. A key insight is that governing the Arctic will require making choices that must grapple with diverse and sometimes conflicting priorities. Participatory processes can more effectively ensure that diverse voices are represented and that all relevant forms of knowledge are included in decisions. The final Arctic Resilience Report, published in December 2016, is the culmination of the Arctic Resilience Assessment's five-year effort to better understand the nature of Arctic change, including critical tipping points, as well as the factors that support resilience, and the kinds of choices that strengthen adaptive capacity. An integral part of the assessment is to identify policy and management options that may be needed for strengthening resilience, for adaptation, and for transformational change when this is necessary. Coming outputs include a Synthesis for Policy-makers (2017), and a resilience-related contribution for the Arctic Monitoring and Assessment Programme project, Adaptation Actions for a Changing Arctic (2016-2017). On June 1st, 2016, Marcus Carson, Senior Researcher at the Stockholm Environment Institute (SEI) and Project Director of the Arctic Resilience Assessment (ARA), presented initial findings from the ARA at the Seminar Thinking Ahead with SEI and KTH: Arctic Futures, past and present. This seminar aimed to set the stage for a discussion about future research directions and long-term capacity building for Swedish polar research, with a special emphasis on the role of social sciences and humanities. In his intervention, Dr. Carson presented preliminary insights from the Arctic Resilience Assessment, after reemphasizing that while climate change is a key concern in the Arctic, other social and environmental changes are also transforming the region and generating uncertainty. The scientist notably discussed a definition of resilience that highlights agency, and discussed some preliminary findings about (potential) regime shifts and essential factors for Arctic communities to cope with change and growing uncertainties. The seminar also featured presentations about several on-going projects on Arctic change at KTH and SEI along with a new Nordic Centre of Excellence. The video of Marcus’ presentation can also be found here and at the top of this page. Watch a short "bytesize" introduction to the ARA project: "Analyzing resilience in the Arctic by Annika Nilsson"
Contact person: Claudia Strambo, claudiastrambo@sei-international.org.